>TUESDAY TUNES – "You Are the Woman"
Today’s song is really special to me for a lot of reasons. This is a song that I remember hearing a lot when I was growing up. My mom would sing this song to me when I was little, and I remember hearing this album playing often at our house. A couple years ago I took part in a spritual direction retreat led by my friend Peg in Wilmore. I signed up for the retreat without knowing a lot about it. I showed up not knowing a soul. I was the only woman there who wasn’t a student at the seminary, and I felt COMPLETELY out of place. I’m not sure I can put into words exactly what this retreat was like. I imagine it was different for all of us. At some point during the weekend, we each got a chance to “work” through issues that God wanted to deal with, and we were guided by Peg (and the Holy Spirit of course) through this process in a loving way. It was totally amazing. I know it sounds wild and a little crazy, but just trust me on this one. I was the last girl to “work” that weekend. I remember sitting through the whole retreat, and wondering what it was that God wanted to work through with me. My marriage? My family? My discipline (or lack therof)? I couldn’t quite put my finger on it, but something inside of me was stirring – I knew God had an issue He needed to bring to my attention. I sat down in that circle of women – nervous as anything – and I tried to steer the conversation towards the issue I finally decided I wanted to work on. We talked for some time, and sensing that this was the wrong topic, Peg asked me to close my eyes, and ask Jesus what He wanted to work through. I closed my eyes, and the memory of a familiar photograph flashed in my mind. It was a photograph I had looked at thousands of times before, but I hadn’t seen it in years. It was my high school boyfriend’s sophomore yearbook picture. I remember squinting my eyes and shaking my head – almost as if I was trying to push the memory away. Peg (she’s just so intuitive) asked what I saw, and when I told her, she knew that we had to found our issue. I’m not going to go into a lot of detail here about what happened. He’s not a caveman – he knows how to use the internet and he may someday find this little blog of mine. We have a lot of mutual friends still, and I don’t want to dredge up old drama. I won’t even give his first name, because honestly, you don’t really care. We dated for a little more than 18 months. We fell in love (as much as 15 year olds can), spent all our time together, had lots of fun, and made a LOT of mistakes. He ended the relationship, and I really did not take it well (understatement of the millenium). He ended up dating a really good friend of mine not too long after that, so that threw our group of friends into a tailspin of drama; sides were chosen, people felt victimized, and we all felt like our little world was crashing down on us (or maybe it was just me). We continued a physical relationship – even though we both were dating other people – and I continued to believe in my teenaged brain that we would be together in the end. Young love is so brutal, isn’t it? Oy – if only I knew then what I know now. Hindsight is 20/20 though, and I definitely see how God worked in my life to bring me through that muck and mire to the point I am today. I wasn’t a Christian at the time, and I only knew Matt as a friend, but God used this situation to bring Matt and I together as best friends, and used Matt to steer me towards the Lord. I am so thankful that God works in every situation for good. Anyway – back to the retreat. We worked on lingering issues I had from this tumultuous relationship. Issues that seriously affected my sexuality, my self-esteem, my relationship with my husband, and my relationship with God. It was an amazing time for me – so healing and wonderful! After we had finished, we were praying together as a group. As these women came around me to pray over me, God brought this song to my mind. I remember hearing the lyrics, “You are the woman that I’ve always dreamed of. I knew it from the start. I saw your face, and that’s the last I’ve seen of my heart.” It was almost as if God were singing it to me! I remember thinking that no one would ever love me as much as that boyfriend once had. Then – years later – I discovered that Matt loved me more. That day, as I heard this song playing in my head, I knew that God loved me even more than Matt could ever dream. He really is the lover of my soul, and although He began wooing me years ago, that day was the day I realized that THIS was the romance of my life. This is like, OUR song…God’s and mine. I really think that when I get to heaven, Jesus will be there waiting to dance with me to this one! With that being said, enjoy “You Are the Woman” by Firefall. This is from their first album, and if you don’t own it, you should! This isn’t the only good song on the album. 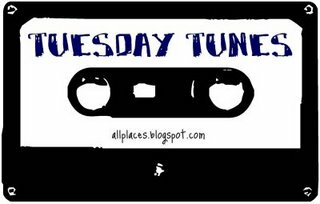 This entry was posted in God, Tuesday Tunes by Katie. Bookmark the permalink. >Beautiful post, Katie. Seriously, got some tears workin’ over here (I know, I’m such a girl).